I've been very excited to go home last Wednesday as it's our last shift for the week! 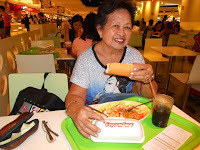 Met my hubby at Alimall Cubao as we'll gonna go to SM Fairview today to have our weekly bonding with my mom. This week, we decided to watch eat out and watch a movie. We normally spend our bonding day at Trinoma/Landmark because it is just one FX and one tricycle away from our village. It is definitely easier and more convenient commute experience if we spend the day there however, we've decided to change our route and try strolling in SM Fairview. Anyways, it's just two jeepneys away from our house and we're sure that transpo is available even if we go home late at night. Today is my mom's 6th birthday! Good thing, I was allowed to go on a leave for two days as I literally beg my Supervisor haha! That's the reason why he is still my favorite Sup - he is so understanding and as long as there is no real impact in the center, it's OK with him. I hope all Supervisors/Managers would be like him. Very warm, intelligent and funny. Hayz, I don't know what's wrong with me as I literally drag myself to write a post here. I used to be very excited whenever I post something here but I'm running out of words and I really feel inadequate. There's really something wrong. Starting tomorrow, I will start my30 day habbit. According to my favorite author and preacher Bo Sanchez, if you want to be successful in something..you need to constantly do it at least in the next 30 days. If so, it will be a habit of yours you will continually do it even after 30 days. I will start tomorrow...I hope I can do this! Aja!